l to r : Terry Small, Bill Holden, Tony Lewis, Ken Middleditch, John Rapson (Manager), Jim Squibb, Allan Kidd, Norman Strachan. the side was simply the strongest in the league, staying unbeaten in league racing at Wimborne Road for the fifth consecutive season. Not that it was all good news, with the club having to overcome the loss of team member Johnny Thomson, who died after crashing in a match at Poole during the opening months of the season. The team’s all-round team strength saw every member of the eight man, first team squad score at least one maximum, with Ken Middleditch finishing the season with a total of nine. Racing at Wimborne Road was generally one-sided with Poole passing the 60 point mark six times and the 70 point barrier on a further three of their sixteen home league matches. The big three of Ken Middleditch, Bill Holden and Terry Small, all finished with averages of over 10 points. Middleditch even managed to break the 600 point barrier for the season, finishing with a total of 615 points from 46 matches at an average of 9.88. Poole also enjoyed a fantastic run in the Daily Mail sponsored National Trophy competition, where they so nearly became the first Second Division side to reach the grand final. They grabbed the headlines by beating First Division Birmingham in the quarter-finals, before losing to another top tier side, Norwich, in a hotly contested semi-final. 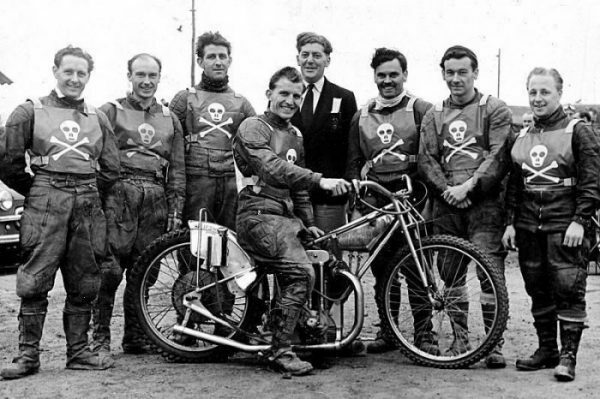 This on-track success brought its own rewards with the Speedway Control Board at last granting the club First Division status, making Poole the only team to have won promotion from the Third to the First Division of British speedway.